As I’ve frequently written on this blog, it feels like the city (the City, if you’re from the 415) is drifting away from these ideals—in the facts on the ground if not in the minds of its residents. So I decided to poke around on the Census website and see what the statistics could tell me. What I discovered was quite stunning: the image of a city behind the curve, with some near-criminal inequalities. In no particular order, here are the first rounds of what I found. There’s lots of additional data out there, so I hope to expand on this in future posts. Unless otherwise linked, these numbers and images are from the (amazing!) Web site of the United States Census. The median household income in SF is $72,947 to Manhattan’s $67,204, about 8.5 percent higher. San Francisco’s Gini coefficient (the most common measure of income inequality) was about .52 in 2012 – which, according to World Bank figures, is higher than Nigeria. Here, the city does less poorly compared to others, which I don’t find very comforting. Oakland is about the same, at .52, and Berkeley clocks in at .54. Los Angeles is nearly the same as San Francisco. New York is a bit higher, at .54. Of course, America’s Gini is the highest of the advanced economies, anyway (.476, according to the Census, though different data sources give very different numbers). What is particularly striking to me is income inequality in San Francisco mapped against race, which I describe later in this post. Persons under 18 years old are 13.5 percent of the population in San Francisco. That compares to notoriously kid-free Manhattan with 14.9 percent. The figure is 15.4 percent in Seattle; 21.3 percent in Oakland; 21.4 percent in San Diego; 21.6 percent in all five boroughs of New York City; 23.1 percent in LA and Chicago; 25.9 percent in Houston. “Discover the variety of sites, shops, and restaurants that reflect the City’s great ethnic and cultural diversity.” Thus the Web site of the city of San Francisco greets the city’s visitors. Many San Franciscans do cherish ethnic diversity as a principle, and think of their city as a flag-bearer for it. While that love of diversity is wonderful, in 2013 San Francisco is not looking like much of a flag-bearer, compared to other major cities—regionally and across the country. San Francisco is a white-plurality city, with non-Hispanic whites composing 41.7 percent of the population in 2012. (Hereafter, I’ll just use “white” rather than “non-Hispanic white”.) Few would be surprised to hear that this is higher than, say, Oakland (which is 25.9 percent white). But San Francisco is also whiter than California as a whole, at 39.4 percent. San Francisco is less white than Manhattan (47.6 percent), but New York state is far whiter than California, and when we look at all five boroughs of New York, the white population comes down to just 33.3 percent of the total. And it really gets interesting when you put it in historical perspective: California was 57.2 percent white in 1990; San Francisco 46.6 percent. In other words, since 1990, California as a state has become less white 3.6 times faster than the city. San Francisco continues to have a very large Asian population, at 34.2 percent of the total (up from 29.1 percent in 1990). Still, this increase has been slower than the increase in the proportion of Asians in California generally, from 9.6 percent in 1990 to 13.9 percent in 2012. I am sure this observation would be enriched with some data on incomes, which I hope to add in a future post. The percentage of San Francisco that is Latino (or in the terminology of the Census, Hispanic of any race) is, at 15.1 percent, little changed or even a slight increase in the last few decades. But the city is far less Latino as compared to the rest of the state than it was in 1990. In 1990, California was 25.8 percent Latino; today it is 37.6 percent. In context, San Francisco has become less Latino as compared to the state in general. The shrinking of the city’s African American community in the last two decades is one of the most remarkable ethnic shifts in the city. African Americans are just 6.1 percent of San Francisco’s population of 825,863 – a 44 percent proportional decrease from 1990, and a 50 percent proportional decrease from 1980. But this is only part of the story when it comes to the troubling status of black San Franciscans: on the whole, they are far poorer than other groups in the city. The median income of a black household, $30,840, is just 35 percent of the median non-Hispanic white household, $89,140. The African American community in San Francisco is singularly left behind. African Americans across the state and across the country also lag behind in median income, but not by anywhere near as much. The median income of black households in California is 63 percent of white; in America in general it is 62 percent of the white median. The gap in San Francisco is also much larger than it is in other parts of the Bay Area. 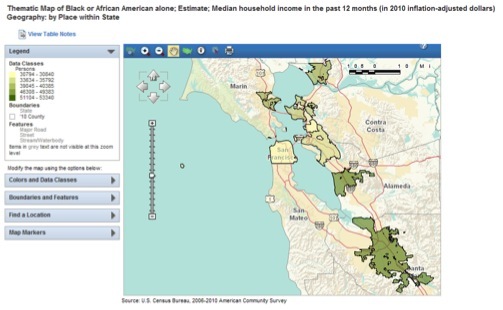 In Alameda county the ratio of median black to median white income is 49 percent; in Contra Costa 57 percent; San Joaquin, 69 percent; San Mateo, 55 percent; Santa Clara, 59 percent; Solano, 74 percent; the Bay Area in general (the Census’s San Jose-San Francisco-Oakland, combined statistical area), 52 percent. But in this comparison to Manhattan, at least, San Francisco can take some small, cold comfort: median black Manhattanites (18.4 percent of the population) make just 32 percent as much as median white Manhattanites. Throughout the five boroughs the ratio is 59 percent. Let’s look at the income of San Francisco’s African Americans in another way, comparing it to other cities in the Bay Area. Darker green indicates a higher median black household income. (These are absolute levels, not proportions.) Starting clockwise from San Francisco, the cities are San Rafael, Vallejo, Richmond, Berkeley, Oakland, Hayward, and San Jose. Now compare this to the median white income for these cities. Clearly there is something different going on in each of these cities. But San Francisco really stands out in that it has a very high median white income and an extremely low median black income. This will not be a surprise for anyone who has spent 20 minutes on Potrero Hill (which is divided roughly 50-50 between gaudily painted restored Victorians and vast rows of housing projects, and whose ethnic and racial make-up is similarly divided). Many of the aspects of the narratives that San Franciscans tell themselves about their city are flawed at best, and sometimes simply false. The image of San Francisco as a paragon of diversity is no longer true. It is not that San Francisco is homogenous—not by any means—but rather that compared to many other major cities in the state and the country, it is wealthier and whiter. Most of these inequalities are probably related to the lack of a useful affordable housing plan, without explicit racial overtones (though San Francisco certainly has a history of that), and lack of regional coordination in urban planning. Still, these statistics show that, when it comes to being progressive, talk is cheap. The numbers are out of whack with the rhetoric in San Francisco. Maybe it’s time to come to grips with the kind of city we really are: unequal with racial overtones, inaccessible to families, a follower rather than a leader in regional demographic trends of greater diversity. It was 10.9% in 1990 — 79,039/723959; 12.3% in 1980 — 86190/678,974. Table 58 page 49. Your analysis seems to imply that an entity, San Francisco, has chosen to become this way. What would you have San Franciscans do, give up our liberal values because our city is not as we would have it? It would be interesting to see a nuanced discussion of how these disparities have come about. Also, your racial analyses, derived from the US Census data divide groups up into Asian, Hispanic, African-American, and White. This ignores the diversity that comes from Spanish speakers from Mexico, Guatemala, Costa Rica, Honduras, El Salvador, Bolivia, Peru, Ecuador, Chile; and Asians from The Philippines, Thailand, Japan, China, Indonesia, India, Pakistan, Vietnam, Cambodia, Laos, and on and on. And what about mixed-race individuals? As usual, you push a San Franciscan’s buttons, yes you do. I do hope to expand my analysis of census data, which includes at least some of those additional breakdowns. 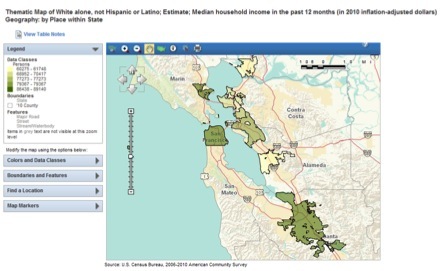 (You’re right that there is rich diversity within the Census’s ethnic group categories, in San Francisco and everywhere.) But this it’s really a list of facts, not a suggestion that San Franciscans abandon their values. I’d like us to exert more energy to make sure our cities’ policies and livability are in line with our values. I’m hoping that we can take an honest look at what the city has become. If factual comparisons just provoke more excuses, I guess nothing will do the trick. But: a note on the Gini coefficient: Even if we value equality, the Gini coefficient not very useful for evaluating a city. We live in an unequal society. Would we rather that SF housed only the very rich, or only the very poor? Or only the very middle? I like living in cities that are diverse, and that includes diversity of incomes. Indeed, I like living in cities that welcome immigrants and homeless people, both of which will drive up the Gini coefficient. So although it is a useful statistic for painting a demographic picture, it says almost nothing normative (except, in my opinion, good things). Thanks Ariel, that’s very interesting. I know the Gini coefficient has many problems but hadn’t thought of this one when drafting this post. (I had seen the Gini used in other news reports to compare cities.) At what geographic scale would you start seeing Gini as an interesting statistic? Or is it that you think income inequality is salutary at the level of the city? And isn’t it true that you can have a diversity of incomes but a lower Gini, as long as a greater proportion of the income is taken by those in the middle? I’m not a fan of extreme income inequality in a large city, as I think it breeds resentment, erodes trust, and causes rifts in communities. Given that I think that high inequality is bad for a city (even if it’s true, as Bloomberg has said, that billionaires love nice public parks), would there be a better way to look at city-level inequality? Mobility maybe? (I’ve read that SF does well on this indicator). Is it possible to compare the inequality of different cities? In any case, as I mentioned, what I found to be the most startling aspect of income inequality in SF is the gap between median black and white incomes. So many things to respond to! I completely share your view that inequality in proximity breeds resentment, but also, inequality in separation breeds ignorance. I’d rather the former (especially since I think the resentment doesn’t go away much with distance–people the country over have a lot of resentment for “Wall St.” even if they’ve never seen it.) There are more practical arguments for integration: mixing rich and poor means mixing resources for things like public education, transit, and all the things we liberals love. On Gini: it is an interesting descriptive statistic at all scales. However, it can’t be viewed in isolation of 1) inequality and average income in the broader area from which we have migration (e.g. the bay, all of California, US, the world) 2) changes in inequality and average incomes over time. You can imagine five cities, all with completely homogenous populations, with all the poorest people in city 1, the second poorest in city 2, …, and all the richest in city 5. They all have perfect equality. Then there is SF, with all five mixed together, and the most inequality. It is interesting that the inequality is different across the cities, but noting that is ignoring most of the story. I didn’t read all your racial analysis carefully, but it’s possible you could have a similar problem, since [I think] you don’t take changes in time into account. The reason median incomes are so different could be that all the rich white people suddenly want to live in SF, and SF has historically had a remarkably poor black population relative to the rest of the bay (I’m not claiming this is true, just that it’s a story that explains the data). That may be problematic, but certainly less so than a true story of divergence. It is not really SF’s fault if a bunch of Silicon Valley types are suddenly moving to the city (although it may be SF’s fault that there are not enough luxury high-rises to house them without encroaching on precious neighborhoods, driving everyone else out–which you would see if we had time trends by income). It is also not SF’s fault that only white people get those Valley jobs. That’s a broader problem in society. So I think you hit the nail on the head when you talk about mobility. Obviously this can be hard to measure without some serious statistics, but I think a great way to look at it is where it’s best to be poor. One question to ask is: where are people moving? Presumably if poor people are leaving SF, it’s not a great place to be poor. A second thing to look at (development folks do this a lot) are non-income outcomes conditional on income. Do poor people born in SF get better education and health care than elsewhere (cross-sectional)? Are they more likely to get those tech jobs than if they’re born in Alameda? Is it better than ten years ago (time-series)? Is it diverging more or less than elsewhere (differences-in-differences, or comparison of time-series in a cross-section)? These stats more precisely attack the question of whether SF as truly a place of opportunity, or more a place for rich people to settle and poor people to stagnate. Ariel thank you so much for your thoughtful comments. It’s my dream that a blog post would spark such a conversation. Even more things to reply to! I hope you’re as interested in these questions as I am and won’t mind this long response. First, let me just back up a little to say that the point of this post was, more than anything, to show the difference between how many San Franciscans see their city, and what the reality is. In that sense, I don’t thing there’s any flaw in using snapshot data for a single year on income inequality. Where San Franciscans believe that their city is an exception of equality or at least equity, it actually hews to the broader rule of income inequality in America, and in many regional comparisons exceeds it. But what should really be startling is the racial income inequality between whites and blacks. Just as a snapshot — regardless of what the trend is (and I have my strong anecdotal suspicions about that) — this should be startling. I hope it is. So SF is not just the victim of regional- or country- or world-level trends. I don’t think we can pass the buck so easily. Nevertheless I agree with you that a lot of the solutions come down to the supply and demand of housing (and not just luxury housing for the rich people so they don’t take over neighborhoods, but also subsidized housing for lower income levels). SF has a housing supply problem. I also think, in arguing for a diversity of incomes in a city, we have to be careful to distinguish between needing a strong tax base and needing rich people per se. A strong middle class also (associated with a lower Gini + high median income?) provides a robust tax base, and is more likely to care about public services. Rich people who send their kids to private schools and create parallel private transportation services that cost a little bit more (really happening in SF!) are not contributing their resources to the infrastructure that poor people use. I don’t think SF public schools are particularly good, in general, are they? On the other hand, I have to admit that some parks (Crocker Amazon comes to mind) have really improved a lot in the last 10 years. Anyway this data didn’t convince me so much that SF is exceptionally unequal, just that it is not exceptionally equal in any way — and this goes against many residents’ self-perception. I would love to see mobility data like that. I suspect it will be really hard to get at the city level, as it would be quite a complicated study. I will look… please let me know if you see anything like that! Hey Eamon it’s lily, Moshe’s wife. We live in Berkeley, not too much better, and you synthesized a change that we have felt and tried to express. When I worked in Bayview I came across these census maps. The put a visual to all the disparity and inequity. You should mess around on the nytimes census link. It’s really striking. http://bayviewmagic.org/community-education/. Scroll down on this page to the every city every block article. You can see things like income, race, education level all mapped. San Francisco could have addressed this issue a long time ago by making sure that affordable housing was available in most neighborhoods. As middle income whites get priced out of hoods they normally flocked to, Pacific Heights, Noe Valley, Sunset, they begin to look to other neighborhoods they can afford, i.e. the Mission district. As they begin to move in, so do the organic grocery stores, artisanal bread shops and free trade coffee kiosks. Once those businesses populate the main boulevard, rents and housing prices rise. I don’t say this to be sarcastic…it’s the truth. I love organic food and good coffee, but I also like to see people of color. Word. I’m definitely not trying to argue that SF actually is an innocent victim of market forces, only to point out some potential ways that data could be misleading in a hypothetical sense. And trying to think of hypotheticals that at least are semi-believable. And I’m not reading super carefully, since I’m supposed to be doing problem sets! Sorry if I am implying that you aren’t looking at something but you actually are. But yeah, a post on the historical causes of exodus of African Americans (as well as some time-series on population numbers) would be exactly the type of follow up that would add depth to these numbers. Okay no more responding only homework. This has been fun! You’ve definitely succeeded in making me feel my headlines are a bit sensational based on the rather basic data in this post. (It is a disease of headlines, I’m afraid.) There are many narratives you could draw around these few facts. I definitely appreciate you problematizing that. And I’m glad to get the conversation going. The Bay Area media scene being what it is (no New York, sadly), when these issues ever come up the discussion seems to be hopelessly shrill and emotional — and thus more easily dismissed. I’d love there to be a more practical discourse. I hope to provide you with more opportunities for study breaks soon. Thanks again!